Working with multi-CAD is an engineering reality today. This eBook outlines the biggest challenges and potential solutions for this important topic. What causes multi-CAD data issues? How do recent CAD innovations help work with multi-CAD data? A nasty reality that every engineer must face is working with design data from suppliers that has been created in varying CAD applications. Working with such data was a terrible non-value added activity. However, the recent changes in the CAD industry are offering some new hope specifically from direct modeling approaches and visualization technologies. This change prompted me to write an eBook that took a look at these age old problems in the light of these changes. Here’s a quick excerpt. This eBook is good for engineering managers and directors with engineering teams struggling with design data from other MCAD applications. While the ideal is that all of these teams would work with the same tool, different organizations often use different CAD applications. This lack of CAD harmony can mean a real CAD headache; when you move a 3D model from one CAD application to another, you can lose hours and even days trying to get clean geometry and to make even the simplest of modifications. That, in turn, causes all sorts of havoc in the design process. Unfortunately, the productivity loss because of CAD interoperability has gone on for so long that most engineers and designers are resigned to their fate. Despite the gloomy past, there are some good reasons to not give up hope. Over the last few years, there have been dramatic shifts in the technology used in CAD applications – many of which apply directly to CAD interoperability. 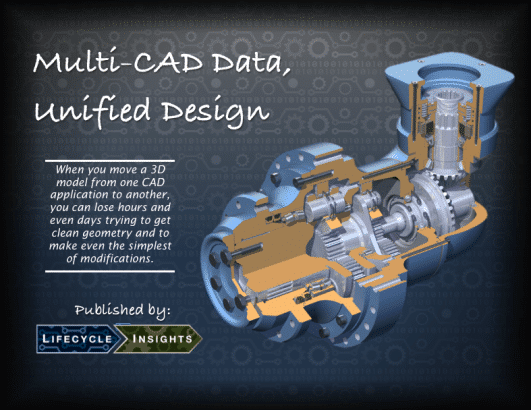 This eTopic explores the topic of working with multi-CAD data in the design process. Specifically, it digs deeper into the challenges of traditional CAD in this regard as well as how the latest CAD advancements offer capabilities to address interoperability needs.